I have a very regular sleeping schedule that usually entails waking up between 5:30 and 6 am and being back in bed by 10pm. 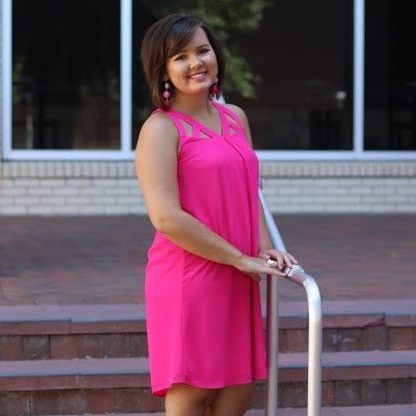 This weekend was all over the place but BOY was it FUN! Let's get into it. I don't have classes on Friday so Thursday after class is when my weekend kind of starts. 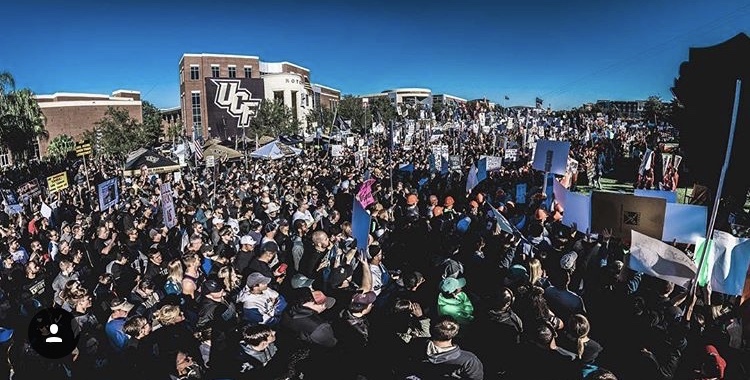 Earlier this week, ESPN College Gameday announced that they were coming to UCF for the UCF vs. Cincinnati game. After a morning of working and homework, I was so excited to have my bestie, Lauren over for some much needed girl time! It was actually chilly out for the first time this season, so we wasted no time breaking out the matching scarves and taking our annual Christmas photo. It is a little early this year, but it was nice out and we were drinking peppermint hot cocoa, so we felt in the spirit. That night, I ran to Michaels to get the gameday sign necessities. My sister and I spent that night arguing over who should do what sign, and I inevitable messed up one of the signs and she ended up being right and the most patient (hi Meredith). Although one of our signs was a fail, we still loved how our other one ended up and we were PUMPED for the event the next morning. We ended the night, by catching up on the CMA's where Carrie Underwood once away blew us away, and then tried to tuck in early! I was up and at it by 4am working before getting ready for College Gameday. My sister and I were decked out in our shirts, beads, stickers, and signs ready to go several hours before it started. When we arrived, the campus was already so full and we were scared that we didn't get there early enough and would never be able to see anything. We got lucky however and got into the Coca-Cola section right behind the stage. Sadly, this section didn't allow signs, so we only have a few pictures to prove we did actually make one. 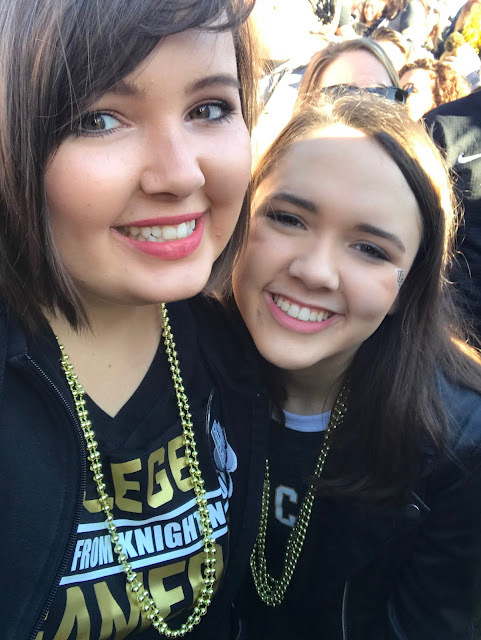 We tried not to think about the complete waste of money and energy that was and instead were pumped to cheer for our Knights and see the guys we have grown up listening to. Y'all, I was screaming and fangirling over these sports announcers for hours the way others freak over celebrity singers. 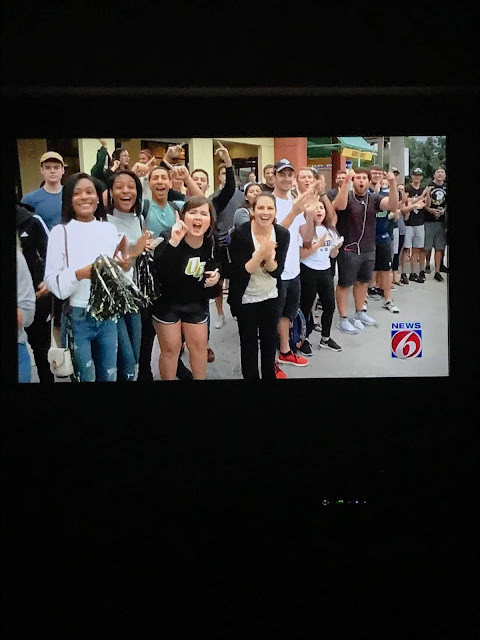 Our section was on TV several times, but my sister and I are so short, we doubt anyone could see anything but the tops of our heads. Oh well! 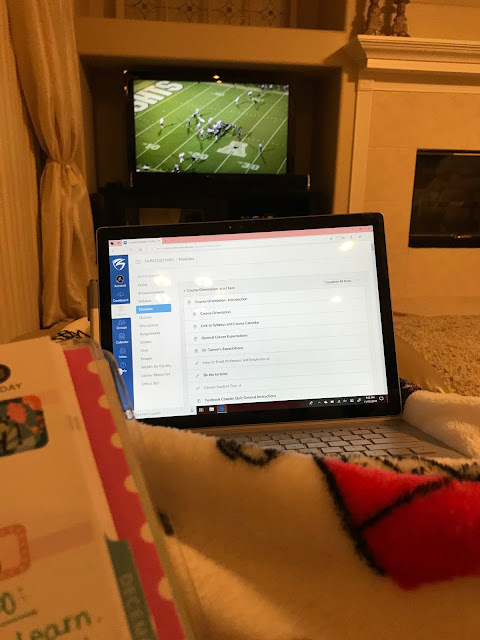 I came home and zonked out for a quick nap before waking up and doing some homework while watching the big UCF game until it ended around midnight! I am happy to report, the longest college football winning streak CONTINUES!!! Sadly, I slept straight through my alarm and missed church, so I did church at home and then I began cramming for exams and projects I have coming up in school. Sadly, I have several classes continuing up until the day of Thanksgiving, but you gotta do what you gotta do right? What a fun weekend! I would like to say that this week is going to be calmer, but with Thanksgiving and birthdays in the family coming up, I think it will be just as crazy and full of fun. Cheers to the holidays! What did you do this weekend? Have a great Monday! Talk to you soon.